October 23, 2013 — So I think, by law, I must insist that you be 21 years of age or older to read this article. Because it can get you drunk. But it starts out with a harmless little diet soda. The year was 2006. I was just hitting my stride with a total Halloween season, I think, and the gods of Halloween showed their approval for my devotion by inspiring the renowned flavor scientists of PepsiCo to invent my favorite soda of all time: Diet Pepsi Jazz Caramel Cream. I know. You can’t even really acronym that. Now, the 2000s were a time of intense diet soda innovation. 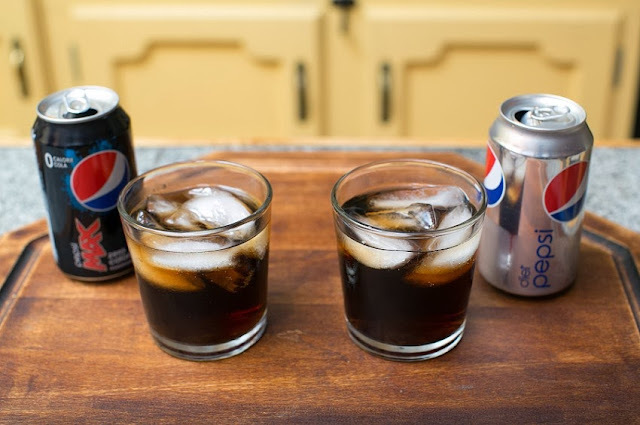 Diet soda had stopped being a drink for moms in a world growing more and more calorie-conscious, if not calorie-active. To capitalize on this whole new growth segment, soda companies starting rolling out a taste rainbow of diet flavors. No more were the choices Diet Coke, Diet Pepsi, or caffeine-free versions of either. Now there were vanillas and limes and cherries and all kinds of variations. They never did get to Diet Coke and Rum flavor, though. 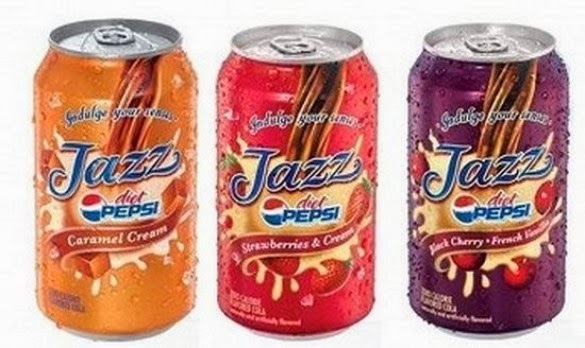 Pepsi’s Jazz line of soda was ahead of its time. Today, companies try to mask their diet sodas…Coke Zero, Pepsi Max, Pepsi One, Pepsi Next. Dr. Pepper Ten…the word diet is verboten for these drinks that are essentially that. And in 2006, Pepsi debuted what it called Jazz, a zero-calorie trio of colas wrapped in splashy graphics that tried to live up to one of the coolest words in the dictionary. 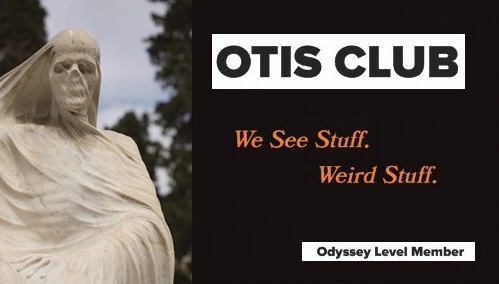 Not only that, they unleashed flavors that were more than just a twist. After all, anybody could throw a maraschino cherry or a wedge of lime into a soda. Jazz sported such flavors as Black Cherry French Vanilla, Strawberries and Cream, and Caramel Cream. Now, I didn’t cotton too much to the fruity flavors, but Caramel Cream, with its bronze-colored can and image of caramel squares ready to be melted down into apple skin, was exactly what I wanted, especially in the Fall. From the reviews I read, I was the only one, though. And that’s borne out by the fact that within three years, Pepsi chiseled the entire line’s tombstone. I mean, I bought a lot of this stuff, but I can’t single-handedly support a whole product. Ever since its disappearance, there’s been a can-shaped hole in my Halloween. That’s right. The enthusiasm for the season you read in this blog is a perforated one. Until now…because I recently discovered caramel vodka. Now things are about to get alcoholic. Vodka is kind of going through the same explosion that diet soda did, just times ten. 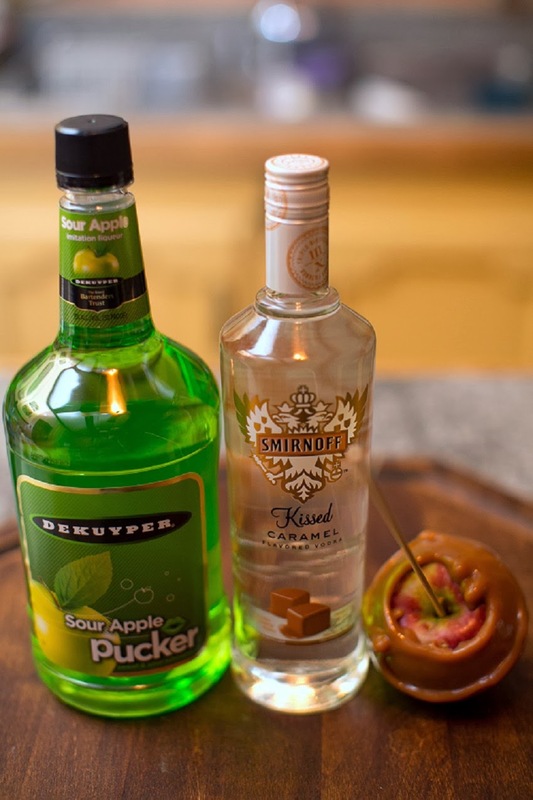 You can get vodka flavored with anything from bubblegum to cloves. You can even get one that tastes like Chicago. And even though I’m a gin guy, vodka is the perfect accelerant for mixed drinks. Most of this season, I’d been merely mixing caramel vodka with DeKuyper Sour Apple Pucker for a caramel apple drink that was, while not my first choice for a Fall cordial, always my back-up. It does fine for watching terrible horror movies and basking in the orange glow of lighted decorations. But then it hit me. I had liquid caramel. I could get Diet Pepsi. That means I could resurrect Diet Pepsi Jazz Caramel Cream. But instead of using electricity, I’d try alcohol. Then I’d know what it feels like to be God. Liquor is the closest thing we have to magic potions. Used right it changes moods and outlooks, gives confidence, creates deeper friendships, makes love connections, but it’s also extremely dangerous when used wrong. I’ve always wanted my liquor store cashiers to be shriveled old creatures, ringing me up while simultaneously offering dire warnings about the power of what I was buying. 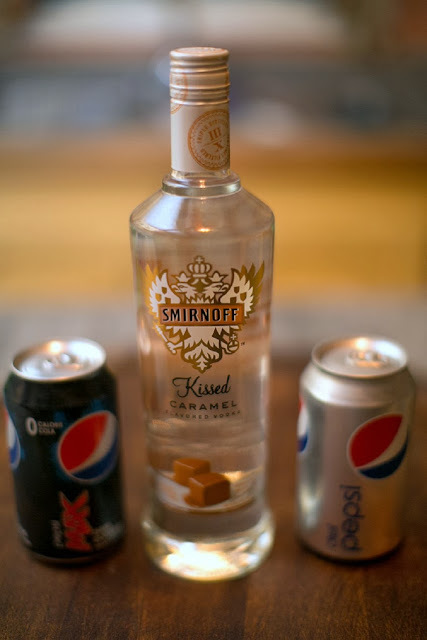 In this case, I chose Smirnoff Kissed Caramel vodka, because that was the only one my store had. I also got both Diet Pepsi and Pepsi Max. I mean, I didn’t have any recipes, so it would require some experimentation. With only two ingredients, there’s not much for me to talk about by way of process. I threw ice in a glass, slopped one ingredient in, and then slopped in the other. 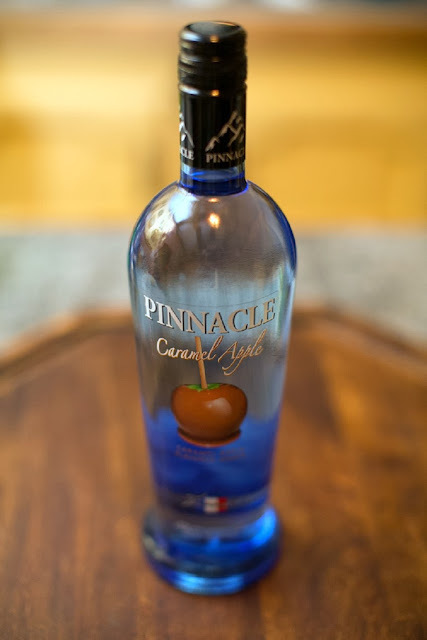 I don’t know if I ever hit an ideal balance, because every variation I tried was good, although I think the more caramel-flavored vodka, the better. It also didn’t matter to me which zero-calorie Pepsi I used. This will be a go-to drink for me for the rest of the season, for the entirety of next season, and, quite possibly the span in-between. I think that’s how it went with Caramel Cream Jazz, too. Although I’ll probably start mixing it with Coke Zero since besides being a gin guy, I’m also a Coke Zero guy…unless Pepsi starts making Caramel Cream again. And speaking of that, my biggest lesson in this whole thing was…that I can’t remember exactly what Caramel Crème Pepsi Jazz tastes like. My taste buds apparently have a terrible memory. I think the above recipe got close, but there’s just no way to test it without an authentic, fresh can of the original. That’s my second hint, PepsiCo. But in conclusion, here’s caramel apple vodka. Good stuff. 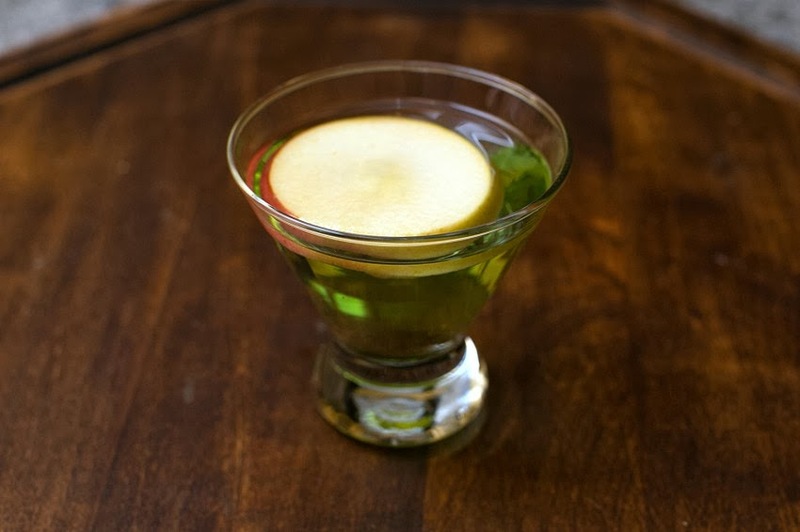 Pretty soon, we’ll never need to eat or drink anything but vodka.